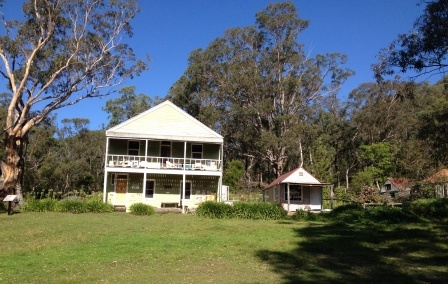 It was with a healthy dose of trepidation that we starting planning a group 4WD camping trip to Yerranderie, a ghost town in the Burragorang Valley of NSW. Our group consisted of 3 families, 4 adults and 5 children altogether, the kids ranging in ages from 8 - 11 years old. Although the adults had been camping plenty of times, the kids had only ever experienced caravan parks or cabin style camping and we weren't sure if they were ready to rough it for a few days. As it was Easter time there was also a fairly good chance we could get some rain, but we decided to go ahead anyway. 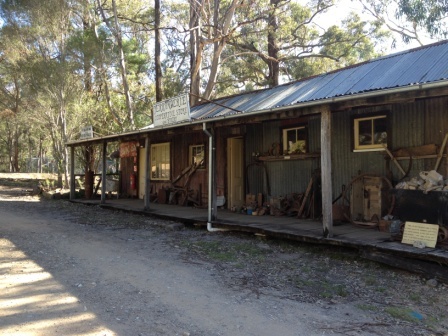 Yerranderie is an historical ghost town which is now run by the National Parks and Wildlife Service. It is located in an old silver mining area which was cut off from direct access to Sydney by the establishment of Warragamba Dam and Lake Burragorang in 1959. It now takes around 5 hours to drive there from Sydney (via Oberon & Colong Stock Route). It is an isolated spot with no petrol, food or water for sale so you must take everything with you and it is best to phone ahead before setting out to get the latest road, weather or fire restriction information. Our trip began with a 6am start in Sydney before heading over the Blue Mountains, stopping for breakfast at Blackheath, where there was a definite chill in the air. After a delicious breakfast at Altitude Delicatessen and a quick toilet stop we hopped back in the vehicles and headed over Mt Victoria. I don't think I'm the only parent who has trouble getting her screen-addicted children to actually look out of a window during a car trip and my remark of "Look kids it's Mt Victoria" got the expected response of merely a grunt and barely a glance away from their ipods. The adults however were enjoying the views. I find it is always a refreshing surprise to see the sun-drenched valleys on the other side of the mountains and a relief to be finally out of the city. It wasn't long before we arrived in Oberon, the last stop available for supplies before heading in to the national park. After stocking up on last minute essentials (thank you Oberon bakery and IGA) we stopped in at the Oberon Tourist information to ask for a more detailed map in to Yerranderie. The staff were extremely helpful and friendly & provided us with maps and other useful information sheets. The kids were sent off for their last pit stop behind the tourist info but were side-tracked by a fantastic park they discovered just nearby. Back on the road we passed through pine forests before coming to the entrance to the national park. The entrance is marked with a sign "Oberon - Colong Historic Stock Route" along with warnings to carry spare food, spare water, spare tyres & extra clothing as there are no provisions available past this point. 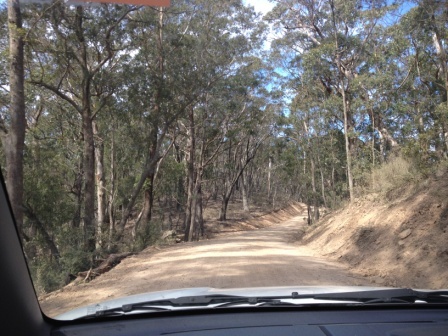 There is 60kms of dirt road in to Yerranderie. 4WD vehicles are preferred although it is passable in 2WD when the conditions are dry. The road starts out flat but soon enough starts climbing and winding along the range. It took us around 2 uneventful hours of driving (the only wildlife we saw were a few goannas) to reach our destination. 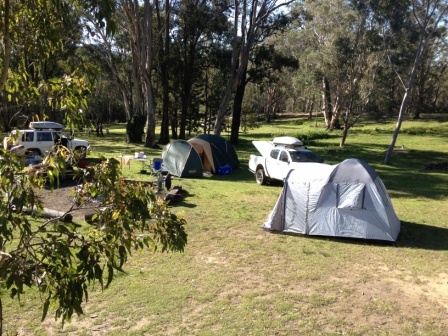 The town of Yerranderie sits in a clearing and has a spacious camp ground which is well-stocked with fire wood. As we were a large group the caretaker John set us up at one of the larger sites, just near the camp kitchen & bathrooms. While the adults pitched the tents, the kids went exploring, wasting no time in claiming their own "base camp", about 30 metres away from the adults. After setting up camp we joined with the other visitors for a tour of the buildings run by caretaker John. The tour started in the old State Savings Bank of NSW and general store building which is set up as a museum. John gave us a brief history of the site, the silver mining activities and ownership. There are lots of old photographs, newspaper articles and mining equipment of interest in the museum. The next stop on the tour is Mrs Barnes Boarding House - an original slab hut & a veritable treasure trove of interesting artefacts from the early 20th century. By mid-afternoon we decided to get the fire started and it was not a difficult job at all as the coals from the previous campfire were still hot enough that we didn't even need to strike a match - winning! The afternoon was spent enjoying the tranquil surrounds and watching the kids play. At last the screens were forgotten and they had all swapped Ipods for sticks and tree branches and the indoors for outside. The boomerang which we brought from home even got a workout. There is a camp kitchen available for visitors to use. It has a gas stove, sink and small bar fridge. The bathrooms are small with only one shower and one toilet in each. All the facilities are basic (and look like they could use a good clean) but are better than having nothing at all. We cooked our dinner on the open fire and dined on sausages and salad. The kids experimented with marshmallows on the fire for dessert and we were lucky enough to have a very clear night sky to enjoy all the stars & point out the saucepan and Southern Cross to the kids, which unfortunately is the extent of our astronomy knowledge. We were fortunate to have a very mild night & morning with not even a chill in the air. 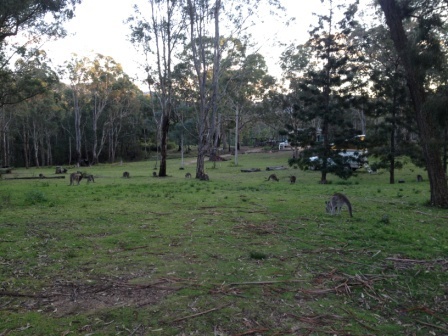 The local residents, wallabies & kangaroos, were out in force the next morning, grazing on the grass in the campground. After breakfast we decided we would tackle "The Peak" mountain climb. Although signposted as a 2 1/2 hour return walk we were overly optimistic that it wouldn't take as long as that, but how wrong we were! Right from the start it is a strenuous walk, climbing continuously with very few flat sections. The kids, aged from 8 to 11, did well not to complain too much while the adults were all breathing heavily from very early on. As we got higher the climbing grew more difficult with the track becoming narrow and harder to navigate over rocks and boulders. I must confess that I didn't think we would all make it up to the peak due to the difficulty of the climb. We had a few short rest stops and after around 55 minutes of climbing finally reached "The Peak". There were high fives all around and a great feeling of achievement for adults & kids alike. We all signed the National Parks & Wildlife journal & got our photos taken at the top (we needed proof that we made it!) 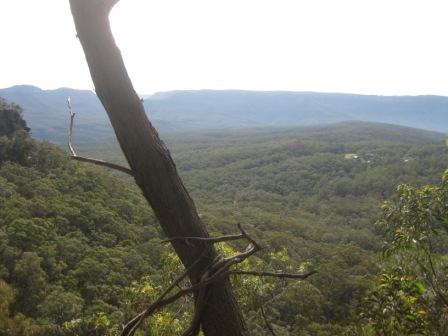 The views of the Burragorang Valley from up there were breathtaking. The trip back down was even hairier than the climb up with lots of slipping and sliding & careful footwork required. I didn't believe it was possible but it did take us longer to get down than it did to get to the top, around 1 1/2 hours, but we all made it in one piece. After a well-earned lunch back at camp we spent the afternoon with some more locals as some of the resident goannas had come out to enjoy the afternoon sun. Later in the afternoon we set off on another walk to check out the Silver Peak mine which is only a leisurely 500 m from camp. It was fun to look around the ruins and imagine how different this place would have been back in the mining days. The kids absolutely loved their first real camping experience and were actually begging us to stay a little longer. But we only had supplies for two nights and the lovely weather was starting to turn. On a drizzly third morning we returned to Sydney via Wombeyan Caves and Mittagong. The trip via this route takes around 5 hours as it is dirt all the way to Mittagong. We stopped for lunch at Wombeyan Caves and did a self-guided tour which was great. The trip was such a success that we will definitely be planning another one soon.